YOU GUYS. 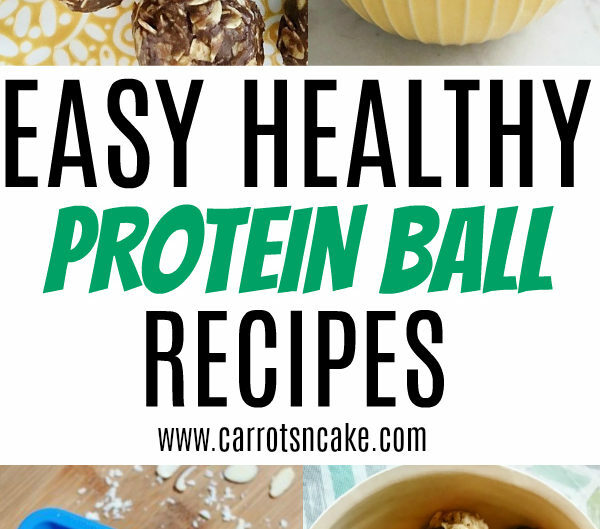 I have your new favorite protein ball recipe right here. 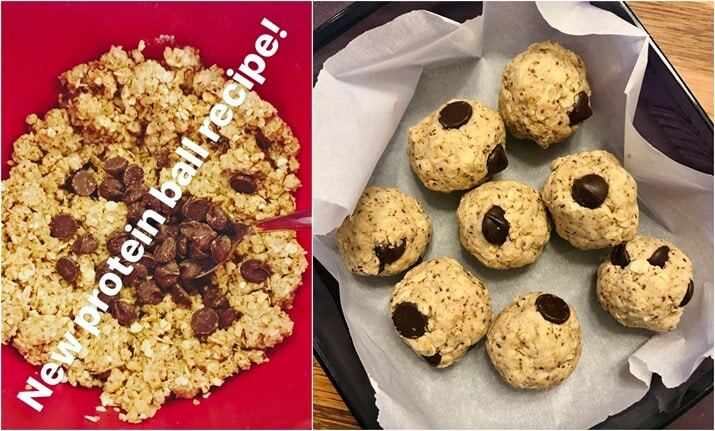 I’m telling ya, these No-Bake Chocolate Chip Cookie Dough Protein Balls are awesome. Awe. Some. You are definitely going to love them! 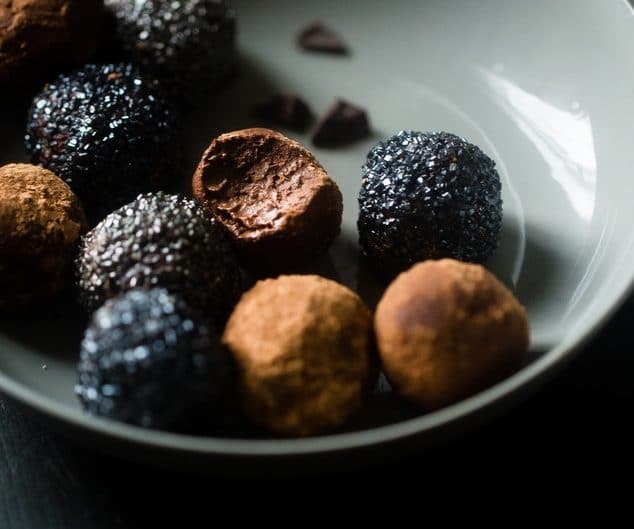 And, like a lot of my recipes, they’re totally customizable to your taste preferences– whether you like dark or milk chocolate, butterscotch or peanut butter chips, or even dried cranberries or cherries. Plus, you can use just about any protein powder you like and really get creative with the flavors. 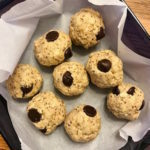 I’ve made these protein balls with vanilla, coconut, and churro protein powder, and ALL three varieties were delicious! 1/2 cup protein powder I’ve used SFH vanilla, coconut, and churro – all soooo good! Combine ingredients in a mixing bowl. Roll batter into 12 balls. Refrigerator for at least an hour before serving. Yum! Saving this for sure! Churro protein powder, say what?! Literally purchasing today. Thanks for the awesome recipe and recommendation! I can never say no to a no bake snack. These look incredible! anything in bite size form!!!!! Yum! YUMMM!! Do you use gluten free rolled oats or just regular? 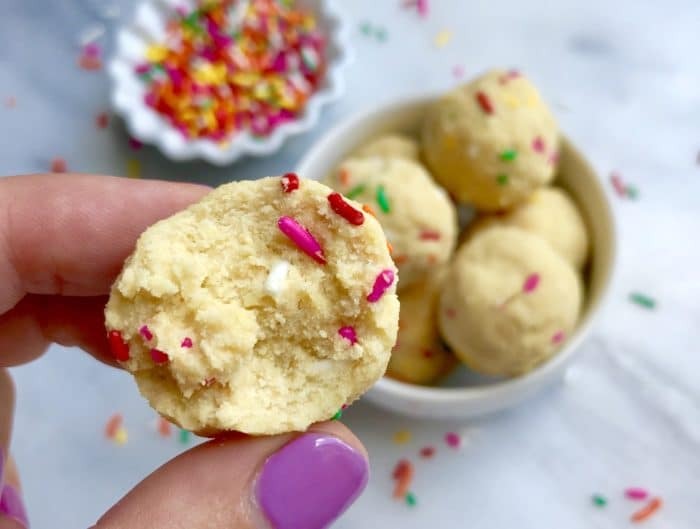 Could I sub pat flour for almond flour? These look delish! Thank you for sharing. I will definitely add dried cherries! These look amazing!! Is there a substitution for maple syrup? I just made these. Off the hook! I used quest salted caramel protein powder. 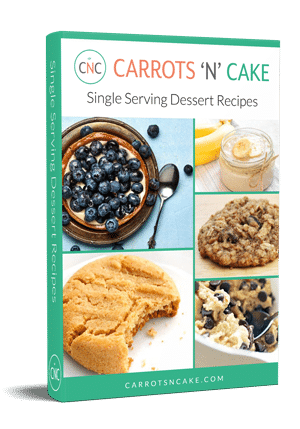 Made these last night – the kids went NUTS over them! They really do taste like cookie dough. I used steel cut oats (all I had on hand) which made them a little chewy/crunchy but still good. And fudge brownie flavored protein powder. Both kids are excited to have these as snacks after school today. And I am hoping my niece likes them, as they are constantly trying to get her to up her protein intake. Thanks for a great recipe! Have you tried skipping the maple syrup? Is it not sweet enough without it? 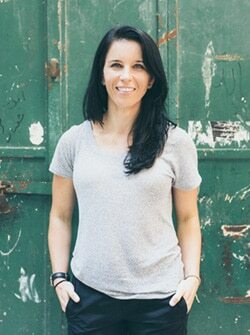 Has anyone skipped the protein powder? Do you need to add anything else instead — flax or something similar?? These are delicious! Thank you! Thanks for providing macros! I want to try these but I’m wondering if there’s a substitute for the coconut oil in order to lower the fat grams? Does that mean 11 calories per ball? THANKS! Can you use all purpose flour as opposed to almond flour if someone has a treenut allergy? If so, what would the measurements be if using all purpose flour? Thanks!